I hope everyone had a great New Years and a great start to 2018. We are getting everything ready for our 2018 season which will be in full swing shortly. The weather has not been typical for us this winter to say the least. We have had 2 snows with a total of about 6 inches here at the beach. With that being said, we are back to 70 degrees and sunny. If you want to shake the winter blues, now is the time to do it. The Seabass are biting very well along with other bottom critters that make for a great time and good eats. My favorite time of the year is right around the corner. The spring bite of Atlantic Bonito. These fish are delicious, and are an absolute blast to catch on light tackle. They are only around for a few weeks, starting and usually ending during the month of April. If you want to get in on the action, give us a call asap, spots are limited. Spring fishing in NC from the beach to the Gulfstream is as good as it gets. Whether you want to stay close for Blues, Spanish and Atlantic Bonito, or steam to the Gulfstream for Mahi, Wahoo, Tuna and Blue Marlin, the Spring is the time to do it. Spring has sprung early this year! 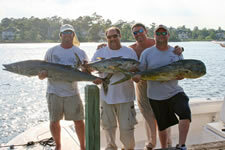 It appears with the warm weather, and warmer than usual water temps, the fishing should be good ahead of schedule. We normally get our annual run of Atlantic Bonito by the 2nd week of April when the water temps hit that 62-63 degree mark, well it’s almost there now, so it won’t be long. The Spanish Mackerel, Bluefish, and False Albacore will be mixed in the Bonito, making a half day trip very productive. The Spring is also the best bite of the year for the large pelagic fish in the Gulfstream (Mahi, Wahoo, Tuna, Blue Marlin, etc..) The bottom fishing for Sea bass and other bottom dwellers continues to be good, and makes for a fun trip right now. The Atlantic Bonito are only here for a couple weeks so book your trip now to get in on some of the best light tackle fishing of the year. The Atlantic Bonito fight like a False Albacore but are very good table fare. The prime dates for Gulfstream trips are going fast. If catching a fish of a lifetime is on your bucket list, now is the time to book your trip. The fishing is starting to heat up. Atlantic Bonito, King Mackerel and Bluefish are biting close to shore. The Mahi, Wahoo and Tuna are biting in the Gulfstream and will be getting better by the day. It will not be long before the Marlin show up. The bottom fishing is good and will be getting better when Grouper opens May 1st. Spring fishing is some of the best of the year. Give us a call to book your trip. 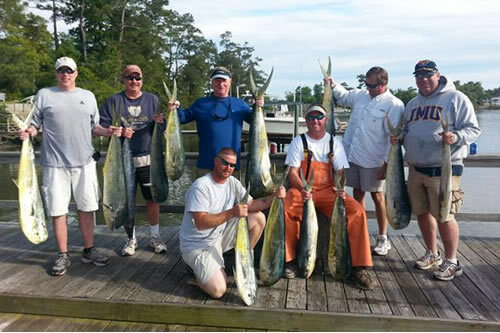 You are currently browsing the archives for the Topsail Beach Fishing Reports category.